Its 5 am when I wake up. My cloudy eyes peer out of my tent into a shroud of thick mist. The plan has changed, I need to get out of the mountains as fast as possible. Hurricane Florence is predicted to hit in the afternoon tomorrow. I have just under 280km to ride and a day and a half to do it. Rubbing the sleep from my eyes, gritty hands covered in small cuts, stings and salt. I am covered in a fine layer of dried sweat, seasoned well with leaves and branches and mud splatters. This is no beauty pageant, I have got to get riding before the storm hits. Although I wanted to ride the whole VMBT, I found the trail too difficult and with my hurricane induced timeline I needed to get to tarmac and make some progress. A short and actually very fun track brings me to Perry, a few small houses dotted loosely within sight of each other. Like a party where only the first few guests have arrived. They are standing off waiting for reinforcements. The closest house to me has a confederate flag hanging above the garage. It’s a flare of colour on a faded baby blue wooden house. Its paint looks beaten by wind and weather and the grass has grown wild and forlorn, an old American muscle car sits crouched in the lawn rusted into position and hemmed in by weeds. A man-made metal tiger caught mid-prowl then ravaged by time and nature, a project long ignored and relegated to the bottom of the to do list. This rural snap shot of America is fascinating to me, my first time in the country and I am loving seeing these places, like de ja vu of a place I have never been before, only seen and heard about in television now I am seeing it for real. Once I hit smooth tarmac its game on and I put myself into touring mode, relaxed upper body and legs smooth and efficient, pumping away at the pedals trying to cover as much ground as quickly as possible. Even on the back roads which are all beautifully smooth (very different to New Zealand) the going is tough. I am running parallel to the Appalachian Mountains; Washington National Forest is shadowing my right shoulder and I am traversing the foothills. No longer peaking over ridgelines I bob over the foothills. Still every climb saps my legs after their onslaught yesterday. I set my goal on Harrisonburg. A moderate sized town where I can get some internet and try to confirm a place to stay in Roanoke. I just want to be in a town by the time the storm hits. The backroads are deathly quiet all morning. The grey sky mirrored on the dusty grey road punctuated with the dotted ribbon of a white line in the centre. Fields undulate all around like green waves on a turbulent sea. Waves are peaked with smatterings of forest as they spread down from the mountain ridges on my right. In the distance I see deep brooding clouds clinging to the hilltops, but Harrisonburg is in the opposite direction and I beeline towards the lighter grey in the sky. Behind me I can see the rain start to fall and I race away from it. Finally making the outskirts of Harrisonburg just after lunch. A quick stop in the library I find a new route that takes me along the scenic cycle trail of the Blue Ridge Parkway. Epic in its own right for cycle touring this road is a gem of the southern states. Winding along the Appalachian Range with view points and picnic spots. 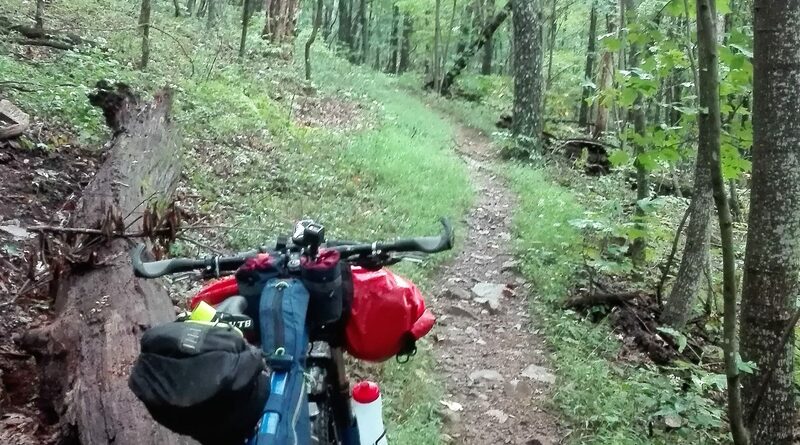 Its not the rugged backcountry experience I hoped for but a very accessible way for me to get to Roanoke as well as being scenic and bike friendly. People travel from all over the world to ride this trail so I feel its perfect for my current needs. If I get to Staunton I have a 145km ride tomorrow to get to Roanoke. The Hurricane is set to land at 4pm. It’s a long way on a hilly road and in a very short time. 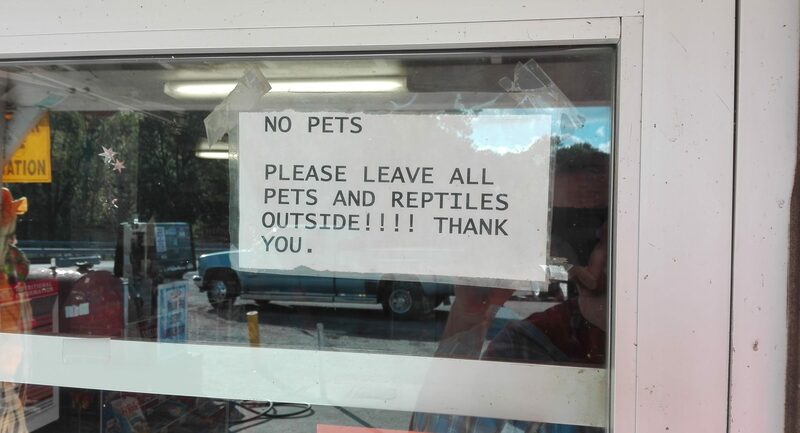 This could be tricky. By mid afternoon my legs are burning and my back is cramping. The weather has settled and even the foothills have started to calm, from a rough ocean to a mere choppy bay of cornfields and farmland. But the sustained pace has worn me out. My head starts to dip and my form slackens. I stand up for every hill trying to drop my weight from leg to leg instead of asking my screaming muscles. I pass a mixture of brand-new barns with gleaming white rafters and 5 pointed stars painted proudly on their sides, then across the road will be a sunken, shrugging trailer covered with moss with a pair of camouflaged pick ups in the driveway. 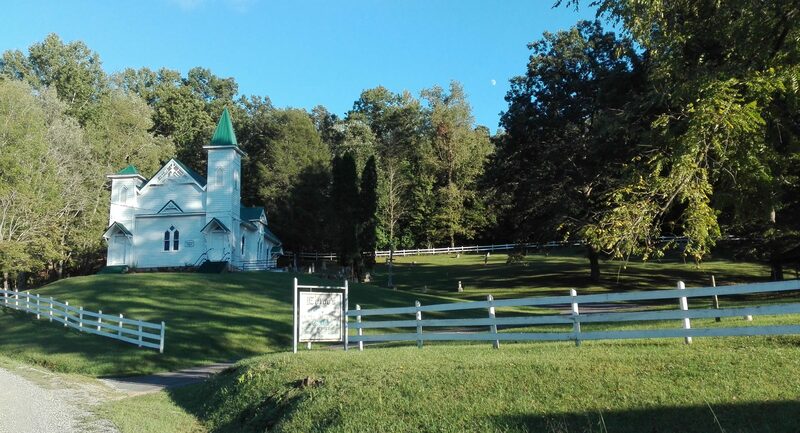 Spotless churches with big welcoming signs and empty parking lots will stand watch on the hillside over a cluster of barns and some industrial size battery-chicken farms. Long corrugated structures with extractor fans on the roof and mesh over closed windows. Every person I see, which is rarely, seems to be riding a lawn mower and very happy to be doing it. I get a wave from everyone, as they look up from under a baseball cap with some farming company logo on it. Some have a beer in hand as they ride their mowers, all have a look of contented satisfaction. Watching those neat lines been cut through their grass. All strictly wearing the uniform of plaid shirt and faded denim jeans. I am startled by a violent barking as a Border Collie bolts out of a farm gate headed right for me. My tortured legs barely move but I am cresting the hill by the time the dog catches me snapping at my feet and bike. I am so numbed with exhaustion I don’t fully register when it actually dives in for a bite, all wide eyed and needlessly angry. Its top teeth hit my foot but the bottom jaw clamps into my metal pedal, I ride flats so my pedals are crowned with a row of jagged screws and spikes. The same things that have torn up my shins again and again now defend me. The dog bounces off shaken but still barking and chasing, more nervous now though. I am also starting my descent and soon it is behind me. Farm dogs generally hate cyclists and I have been chased and barked at a lot but that was my first bite attempt but I am just too tired to relish my victory. Its late afternoon, the sun has about an hour left when I pull in behind a church in a tiny town called Springhill. I’m 20km short of Staunton. Meaning I have a 160km (100 mile) ride tomorrow if I want to make Roanoke. A distance I have never done in one sitting. And never with a 4pm deadline! Again, its an early start but as soon as I begin riding my legs are heavy. The onslaught of the last few days have wrecked them and I cannot get into my normal cadence. I have further to go than ever before but I am going slower than ever. Forcing sweets and sugar into my body to try to fuel the fire but I have very little left in the tank. I ride through Staunton on the road to the Blue Ridge Parkway, I have decided to hitch a small section, 40km or so to the next town then ride in from there. It’s cheating but also it makes sense, to try to ride a ‘century’ (100 miles) on a day a hurricane is supposed to hit just isn’t a good idea. And I have had my fair share of bad ideas. I stick out my thumb and wait in the drizzle for a pickup truck. Dozens pass me. Every truck is huge and can easily fit a bike in the back. American cars are made for this, but I think hitching is just not the done thing. Car after car flies by and the rain keeps coming. I spend 45 minutes by the side of the road before I start to doubt my plan. In Canada this worked fine when I blew out my knee. But this isn’t Canada this is the south, and people are just going about their day. Probably doing some last-minute shopping before the hurricane hits! After about an hour and a half two nice old ladies pull over in their four-wheel drive with a bike rack on the back. Pearl and Billie, after asking that I am not a serial killer, help me throw the bike on the back and we are off. They are driving to Pearl’s lake cabin on the other side of the mountains (away from the hurricane. She is taking Billie there to go canoeing together. 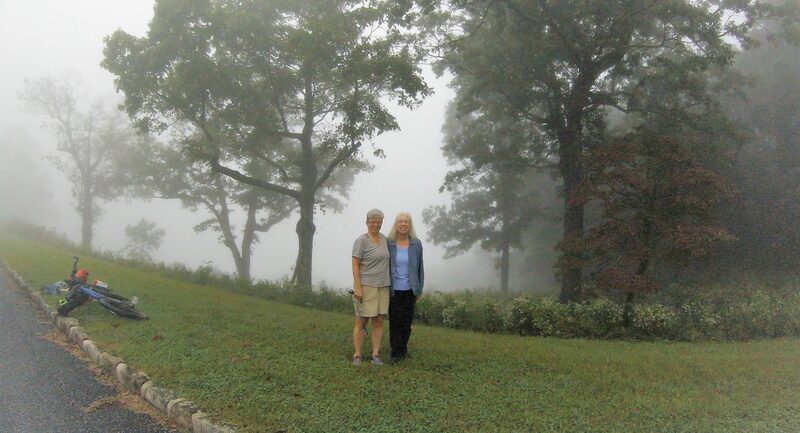 They are new friends who met at church, they drop me off just past Lexington at a high point of the Blue Ridge Parkway. It’s a total whiteout at the top. Still very warm with probably around 100% humidity. I see my first sign of the Appalachian Trail its distinctive trail marker on a post leading into the woods. I ride through thick fog for hours, it clings to the mountain like seaweed caught on coral. Trailing away into the hills but bunched thick around the peaks. I ride past lookout point after lookout point. The interpretative signs barely visible from the road. The few cars I see appear suddenly out of the grey. Even their engine noises are muted and distorted. Visibility is down to about 20m. As I descend into Roanoke I finally get out from under the cloud and the sun actually breaks out. I have just had my first taste of the Blue Ridge Parkway, a section of trail I will come across numerous times on this trip. This time I didn’t get to see a single view, a surprisingly common occurrence for me. 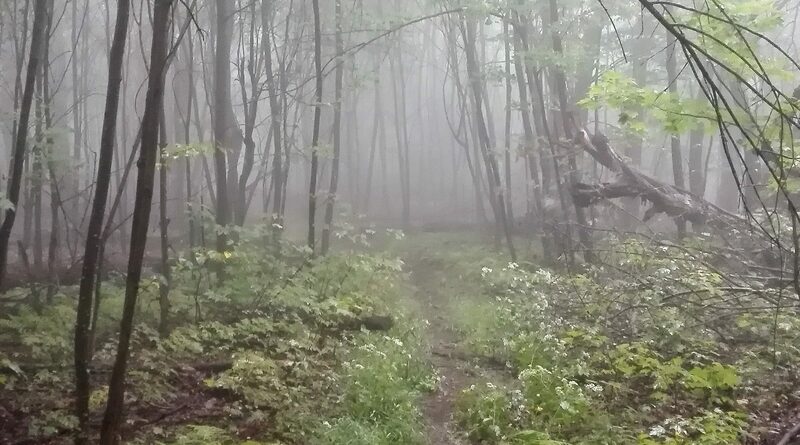 As the mist clears, I see deep into the forest for the first time in days. Its like finally wearing glasses after being blind for so long. The clarity and field of vision is a shock. I stare into the vibrant greens of the forest and the sparkle of wet leaves shining in the sun. When I arrive at Rob and Lisa’s house I am pretty worn out. Even with hitching a ride it’s an 80km day. Plus, it’s been a big week. I pull up and I am greeted into the madness, dogs barking excitedly and a few kids running around. Lisa welcomes me in and shows me around before realising she has to go to a meeting. She leaves the rest of the tour to Rob as she bolts out the door trailing an excited dog and a lost looking young boy with a brush of dark hair. Rob shows me to the garage/ workshop and the downstairs area set aside for bike travellers. He sees my bike and is wildly enthusiastic about my trip. Seeing that I am bikepacking instead of touring. Next thing I know we are in his study. Boxes of GoPros and bike lights and various chargers scattered around two laptops. Both have maps open of mountain bike routes in the area. Rob, it turns out is even more obsessed with riding bikes than I am. He creates and races 100-mile bike events! I feel instantly at home and immediately stoked to be doing the trip. My hardships and failures of the last few days replaced with excitement for the rest of the journey. I have definitely found the right place to wait out the storm! They have even built a bike track around the house! I have found a place to rest and recover and wait out Hurricane Florence. That night I pass out at 9.30pm, my body wrecked, physically, mentally and emotionally but excited for what is to come.